Bank Foreclosure Moratorium Lifted. Frank Calls CNBC & Jim Cramer. A couple of weeks ago Fannie Mae and Freddic Mac (backing most home loans) lifted a Bank Foreclosure Moratorium. I was concerned that the recent 80% drop in bank foreclosure inventory might be a temporary blip with an oncoming tsunami of bank foreclosures. After hours of dead end research. I decided to call my buddy… Jim Cramer from CNBC’s Mad Money. I thanked him for picking my birthday (June 3oth) for the bottom of the housing market, and I proceeded to ask my pal about the Virginia housing market and bank properties. Do you agree with Jim? Don’t forget to subscribe to this blog (upper right corner of the blog) and share it with friends and facebook. p.s. While researching, I found a blog post by Virginia’s Cindy Jones on the topic of Bank Moratoriums. Also check out this detailed post with a great chart. I heard you on Cramer last night Frank – knew it was you right away! Good question – booyah! Frank-Do you really think Jim Cramer has a handle on the Northern Virginia housing market? Is it a coincidence that our inventory of foreclosures had a significant decrease at the same time the fall moratorium? Certainly it would be nice to believe that we had hit bottom but I’m not buying a no correlation theory yet. Here is another post I did on the subject as well. Cramer doesn’t understand housing, so I’ll take his bogus bottom-calling with the tiniest grain of salt. But I did love it when he told off that NAR spokesperson a couple years ago. Today’s Washington Post is actually kind of fat for a Tuesday edition. Then you realize that it sports a rather hefty Classified ads section. The “G” section is a solid 20 pages. But, almost all of it is real estate property foreclosure public notices. They start on page G1 and staggeringly run to page G19. They take up almost as much space as the 24-page “A” news and business section. However, employment ads take up less than one column on G19. More Rants…..
Congrats on getting through, but I wouldn’t consider Cramer anything more than entertainment. I like how Cramer barely listens to your entire question before spouting off an answer. I think his natural reaction is to just disagree. Instead he talked about people in Philly buying in Miami. What does that have to do with bank listing (possibly) skyrocketing in Virginia? Cramer’s calling the bottom probably because he has a vested interest in the housing market recovering. I can’t listen to someone that has knowingly committed fraud. Just Google cramer foment. This was a good publicity for you but that’s it. Had to comment on this as I know the N VA market very well. Why do I know it well? Because currently, my team and I are doing in excess of 200 bpo’s (broker price opinions) every month, and we are not alone. 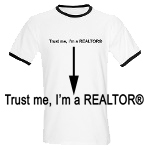 Brokers that specialize in this niche market are all very, very busy. You are right, the flood is coming. There is a “hidden” inventory floating out there that the banks are going to start letting loose in the next 60 days. Where are the foreclosures? Are they coming? Nope, more soon. Or find my dialog over on the nova housing bubble blog. The banks are just hording homes and new accounting rules make it so they dont need to unload anymore. My opinion on this forum will be extremely biased as I am the Vendor Relations Manager for Absolute REO Solutions, Inc. and I profusely believe in our product and in the success of our partner agents along with us. I will try to provide some information regarding what we do and what sets us apart from the competition. Our team is comprised of professionals that have been in the mortgage, real estate and wholesale lending industries for an average of 15 years each. The owners ran one of the largest mortgage broker shops in Illinois and were consistently on the top 10 list of several of the Nations Largest Wholesale Lenders. Our Asset Managers are former Regional Managers and Account Executives from these very Mortgage Wholesale Lenders. As a result they have a wealth of personal connections in the industry with the lenders that remain as both wholesale lenders as well as servicers. In addition to that, through our association with the ICBA (Independent Community Bankers of America) we have access to their 5,000+ member base and are the only REO company endorsed by them. We will have a booth at their Convention in Orlando in March as well as one at the ABA convention in October. We provide lenders with a “one-stop-shop” solution to dealing with their defaulting loans. We offer the option to take the process over from day one, from the first default and start of negotiations with the mortgagors on behalf of the lender to try to find a workable modification plan. If that option does not work out then we try to Short Sell the property to minimize our lenders losses by not incurring additional interest losses as well as property tax losses and legal expenses. If all options fail, we continue on through the foreclosure process. We constantly inspect the properties to make sure that no economic or physical deterioration is taking place while the properties are in initial default or when they become bank owned assets. We have been operational in Illinois and have Banks, Institutional Investors and Private Investors that have handed over their portfolios for us to manage. Due to our contacts in the industry and our presence through their respective associations we have decided to expand out to more foreclosure prone areas and offer our services to a wider client base. Before doing that we have to ensure that we set up a good vendor list of Realtors TM, Preservation Companies and Attorneys that will be able to service our clients needs. In most cases we try to retain the management portion of the transaction and leave the Realtors TM with what they do best… MARKETING AND SELLING THE PROPERTY. As a result, our vendors are able to market more properties in less time without focusing on the many ministerial acts involved in an REO transaction. All contracts, forms and explanations for loan modifications. These are forms that have been prepared by our legal and marketing teams and are at your disposal at no additional cost. By partnering with us you are joining a “Lobbying” group of professionals from within the industry to “Lobby” the lenders on your behalf as well as the possibility to use the tools provided to you from the onset. Finally, as an added bonus, we send our vendors out a 1 GB Credit Card sized memory sticks which contains all the aforementioned forms that are accessible off-line and plenty of memory left to use for their own needs.